A traditional matt nickel 30cm opal glass globe pendant light, featuring matt nickel finish metalwork and opal glass globe for a softer, subdued all round light. Circular ceiling mount and height adjustable chain suspension, with a nickel top gallery holding a medium flashed opal glass globe. Minimum height 45cm, maximum drop 90cm. This fitting has been designed to take bright fluorescent or LED lamps. Non-dimmable if fluorescent lamps are used. Also available in polished chrome, antique bronze and polished solid brass finishes. Please contact us to enquire. 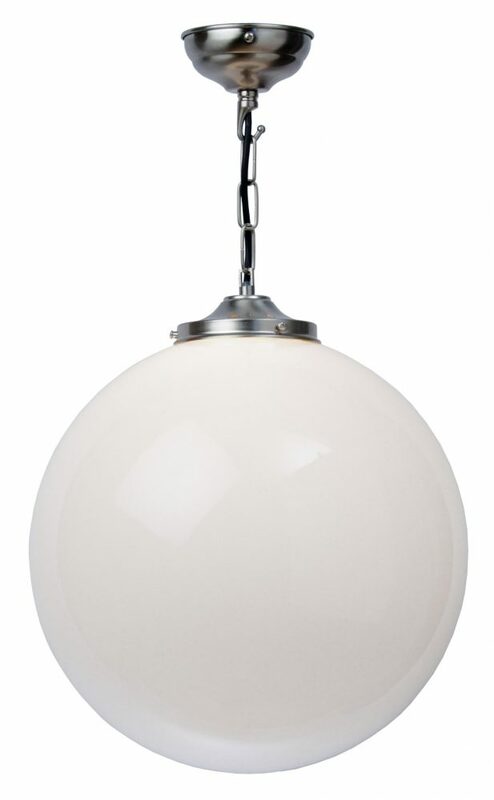 A traditional matt nickel 30cm opal glass globe pendant light, entirely hand crafted in Great Britain to the highest standards.